Although Pattaya city is not as large as Bangkok, Phuket, or Chiangmai, it can offer visitors a great opportunity to shop such a wide range of items, such as handicrafts, ceramics, carvings, Buddhist art, Thai art gallery shops, tailors, jewelry, pirated movies and software, flick-knives, and even samurai sword. Visitors can experience Pattaya shopping in open-air markets, department stores, or even a unique Thai traditional market as Pattaya Floating Market. Therefore, it is not surprise to find products in Pattaya with a wide range of price offered, from incredibly cheap product to highly expensive one. By the way, most of goods are pretty cheap when comparing them to the price you need to pay from your countries. There is a great variety of item quality depending on shops or stalls. 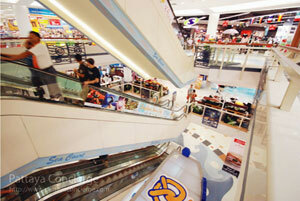 It would be better to compare quality and price from different shops before buying any goods in Pattaya. The mean of comparison also include the task for visitors to bargain the price of any goods. Do not be afraid to make a bargain because it is really normal for the bargain in Pattaya, in particular by foreigners. This has transformed a number of inexperience shoppers, in bargaining techniques, to professional ones. However, if you have heard the word “you pay what you get”, you might have to use this word for shopping in Pattaya. Remember that there is usually no money-back warrantee for shopping here, except in department stores. So, to avoid making a payment to any unrealistically cheap product need to be considered. Also, in Pattaya, credit cards are not accepted in many shops. Cash basis is mostly used instead of the credit card one, and shopping with cash is recommended in Pattaya because this can avoid credit fraud, which is not unusual in Thailand, as well. In Pattaya, visitors will find convenient stores, department stores, and supermarkets that provide similar items as they can find in their own country, but do not forget that the price is usually much cheaper at the same time. 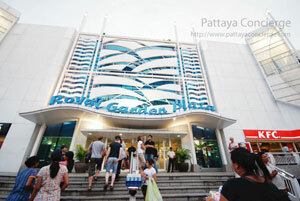 This means that convenience at the lower price is offered for tourists during travelling in Pattaya. In general, department stores like Central Festival Pattaya Beach, Mike Shopping Mall, and Royal Garden Plaza open from 10.00 to 21.00, but visitors can still get in the cinema after that, approximately till 22.00 – 22.30, for watching the last session of films. In the case of hypermarkets like Big C, Lotus, and Carrefour, open from 09.00 to 23.00, but visitors should know that shops inside of this hypermarkets will close about 21.30, or, in other words, after 21.30, visitors would be able to shop only the supermarket section. However, do worries if you would like to buy something for everyday use or some snacks, convenience store like 7-11, which open 24 hours 7days, is ready for you to shop all night. Note that bargain is not acceptable for these kinds of stores in Pattaya. 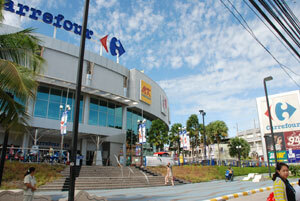 Visitors can find open-air shops at almost everywhere in Pattaya, but the beach road is the major area. The shops usually open late afternoon until late night. A wide range of items are available at these markets, but shopping here bargain is required before making a payment, in particular foreigners. 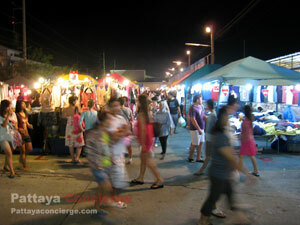 There is also only night market for these kinds of stalls or shops that visitors can go shopping in Pattaya, but they generally do not open every night. For example, Thepprasit night market opens only Friday to Sunday nights, or night market next to the city model fully opens Monday to Wednesday only. These are similar, but not that wide range items, to street stalls at the beach road. In other words, if visitors would like to avoid shopping with high temperature from sunlight, these night markets will be an interesting option. Tailors are another thing that visitors can experience high quality with low price. This might be because Thais are good at hand-made products, and the labor cost in Thailand is not as high as in western countries. Tailors in Pattaya can produce almost styles, so they can offer broad choices of fabrics for their customers. Pattaya Walking Street is a major place for finding these high quality tailors. Finally note that for tailors, visitors can still make a bargain. Thai Floating Market (or Talaad Nam See Phark) is a traditional-made Thai market in Pattaya, where it can be seen as one of tourist attractions in Pattaya as well. Visitors can find products, cultures, and traditional Thai food from four main parts of Thailand - northern, southern, central, and northeastern. Traditional hand-made products are the majority items available here, since this floating market is established for maintaining Thai traditions and cultures. The good thing is that product inside the floating Market Pattaya is not as expensive as other attractions in Thailand. Experience in Pattaya Thai Floating Market would be a unique trip in Thailand, because this market is also popular even for Thai citizens. 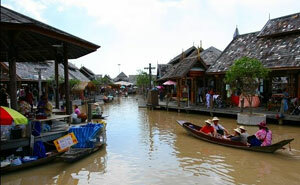 In short, Thai Floating Market is an interesting place for shopping and travel in Pattaya, at the same time. Some stores set too high price for sell to foreigners. In some case, it is higher than twice, compared to the standard price. So, don’t forget to bargain it, otherwise you could be taken adventage from this. Carefully shop gems and jewellery is required for shopping in Pattaya because this could avoid a scam. Visitors should never buy any gems or jewellery from the street stalls, or incredibly special bargain. Only use your credit card with cautions because it is common for fraud of credit card in Thailand. Also, don’t let vendors take your credit card into the place that you cannot see them because they might copy your credit card number. Another thing is that some shop is charge 3% for a credit card payment, so make sure that you ask them before they charge. Finally, there are export restrictions when leaving Thailand, so make sure that you do not take forbidden items as images of Buddha, deities, and some antique artifacts without acquiring the approval from Fine Arts Department in Bangkok.